I came in Saturday and entertained some visitors from the Vintage Computer Conf. I tried to do some TAU debug, but the 729 started streching tape again. The vacuum column switches need to be calibrated. About every forth time the tape gets sucked into the vacuum column, a stretch occurs. The symptom is the same as last time, except that the left column is doing it. Wednesday. The drive moved tape backwards as it is supposed to do. check, printer check, and tape error). * 5050 Load Tape - Pass (on second attempt). indicator either doesn't get set or does not cause a branch. nothing prints. Then tape stops. Gets consistent reader checks. Present were Ron Williams, Bob Erickson, Tim Coslet, Ed Thelen. In the afternoon Ron Crane and Jeff Stutzman came in. Ron demonstrated a number of peripheral diagnostics working - 1402 card reader, 1403 printer, AND lo and behold - the 729 tape drive running diagnostic deck 3050 correctly, no errors. This diagnostic writes a record, backs over it, reads it, and compares the data written with the tape read - and does this about 7 times then pauses, and does it all over again. It is a delightful test, it looks so nice - it makes a nice rithym - just look at that - all that work and the machine is now doing so well. I took a movie the the test - but tipped the camera on end and the result is a tape drive lying on its side :-(( - Next time. Some lowdown - Some lowdown @#$%^^&* redecorated my tool box. Of course all eyes turn to Ron Williams on occasions like this. And he looks so guilty even when nothing is happening!! Grant Saviers brought in two boxes of IBM documentation (via e-bay?) related to Unit Record equipment and the IBM 650 drum machine. I was inventorying the boxes and Tim was enjoying the contents. - had a printing mechanism that looked like a typewriter. Suddenly Tim found this card with very clear print, much nicer than the later 026 key punch with the wire matrix print head. Ed noticed about 20 cards in the "Bad Card" box. 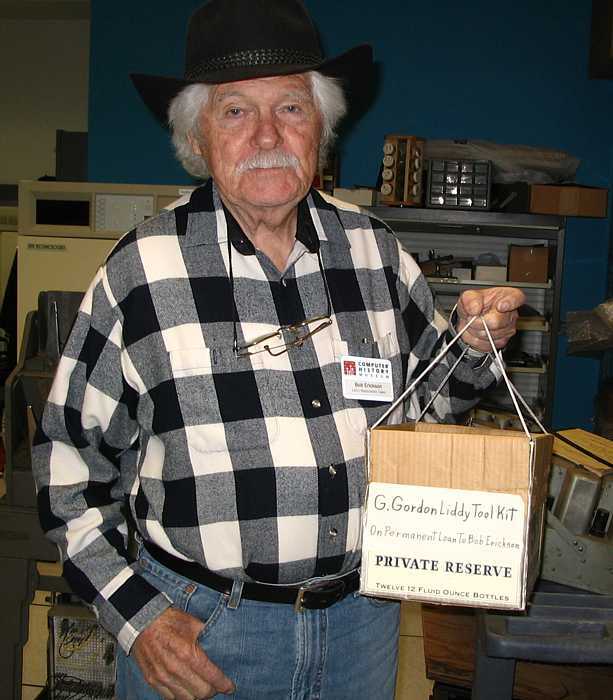 Tim Coslet said that many of those (especially the dual cards used for registers) are very hard to test, and one had so many bad transistors that he was reluctant to do battle with it.) Tim said that it would be nice to make a test jig with proper power to help test cards. There has to be a separate set of test sequences for each card. (There are 225 card types in the 1401 processor and 1406 extended memory, and an unknown number of different types in the 729 drives.) There is apparently some overlap between 1401 and the 1620 SMS cards. There is always an interesting problem that other than standard power supply pins, the other pins can be used for input or output. There are two general sets of voltage levels in the 1401 cards - see page 6 of IBM Standard Modular System SMS Cards Form 223-6875-1 (35 megabytes) or this page 6 only (660 K bytes). The above document mentions modifying +6 and -12 volts for margin checking, leaving -6 and +12 steady? There are several SMS card types that are "double wide", using two SMS sockets, one for power and for logic I/O and the other for more logic I/O. These cards can be quite packed and may contain say 12 transistors and many diodes, resistors and other components. - They can be quite challenging to test and trouble shoot. The general purpose pins need to provide quite a variety of input voltages, such as for checking the gain (beta) of the NPN and PNP type transistors, as well as a variety of loads, such as open collector, various pull up and pull down resistors and voltages, and measuring the currents or voltages output for beta testing. The circuitry and control for "pin drivers" is likely to be "interesting". Tim Coslet suggested that Mike Cheponis propose a "pin driver" circuit. SMS cards containing flipflops will have to provide test sequences to initialize states to verify changes of state under specified conditions. Fortunately, the usual SMS card circuitry is so limited and simple that a "bed-of-nails" test accessory is probably not needed in most situations. In complex situations, the operator may have to place test probes (inputs and/or outputs) at specified card locations to adequately determine card characteristics. Or some of the functionality of the card would have to be tested by more manual methods by electronic types. The exceptional cards might include printer hammer drivers (70 volts at briefly 1 amp?) and core sense and tape preamplifier cards? It is presumed that the potential card tester will be connected to a PC with a USB connection to be driven and monitored by the PC. The PC would contain the test sequences and instructions for each card. This is a large subject. Fairchild had a whole division supplying hardware and software to other firms for testing their proprietary cards. Designing, building, programming an SMS card tester may be a challenge even larger than restoring the 1401 system?!? Keeping the pin drivers functional in the face of operator errors and bad faults could also be a continuing challenge? 1. The CTDL cards in the 1401 and the SDTDL cards in the NAND TAU-9 use different pins for DC voltages. You can verify this by looking at the card diagrams for the CTDL Trigger CW-- and the SDTDL Trigger DHF. The Overlap Engineers forgot this when they put some CTDL cards in the TAU gate on the first Field B/M I installed in story # 33. 2. The Hammer Drivers put more current through the fuse than its rating but only for a short time. I once worked on a bug on a 2821 Printer Control where there was a cold flow backpanel short between the T5 hammer fire line and the carriage 2 stop brush. The T5 pulse was a 5MS pulse but the carriage 2 stop bursh was 50MS long. The printer would print fine until the carriage came to a 2 hole in the tape and then it would blow the fuses in position 50 thru 59. I wrote about this in story # 41. Present were Ron Williams, Bob Erickson, Bill Flora, Frank King, Glenn Lea, Chuck Kantman, Don Cull, Grant Saviers, Ed Thelen. Frank King worked on the sorter. Chuck Kantman tried to use the local PC to access the Internet to look up manuals for the 083. There seems to be a connectivity problem this	week also. Bob Erickson and Glenn Lea contiues to cut and drill Plexiglas to help show the insides of a working 077 collator. Bob also consulted on the sick relay of the second (borrowed from Selam) 026 key punch. Grant Saviers came in with some large ?14x28? inch high quality, glossy images of IBM's initial ads introducing/announcing the 1401 system (in Time Magazine ads?). He also has the appropiate Time Magazine cover image. Very interesting and attractive. When mounted he plans to hang them on the north wall where visitors first come into the 1401 room. :-)) Several of the practical 1401ers had useful suggestions. Today the spirits of chaos ran amuck in the 1401 room. I am not sure of any of the measurements or observations that we made, so I will report only the most basic. Last week we had a solid failure on the Tape VRC diagnostic. The diagnostic failed on every record where a read parity error should have been detected. According to the diagnostic, "Branch on Tape Error" never occurred, so I suspected the error bit was stuck off with respect to tape reading. I recorded an entire tape with records filled with 'V's (C-A-4-1 characters, 7-track tapes normally use even parity). I expected that performing "odd parity" tape read instructions would not cause the errors that they were supposed to cause. The read operations worked perfectly. The 'V' characters were transferred to memory (with correctly generated odd parity). The branch was always taken on the "branch on tape error" instruction that followed the read. This contradicted the symptoms of the diagnostic. I then modified the program loop to perform "even parity" tape read instructions. I expected that the branch would never be taken on the "branch on tape error" instruction that followed the read. Instead the branch continued to be taken. Further debug showed that characters read appeared in the TAU A-Reg as "A-4-1" and in the TAU B-Reg as "C-A-4-1". The registers load in parallel, but use different clipping levels. So, we expected a weak level at the clipper inputs. Then the sampling scope started to act strangely. In storage mode, channel 2 always seemed to be set at 0.1V/div, regardless of the control knob setting. Using a different, non-storage scope, we determined that Read Bus bit C was stuck at logic 0. Now we were not sure that the 'C' bit was ever written on the tape and had no explanation of why the B-Reg thought that it should be turned on. We traced the missing 'C' bit all the way to the 729's read head. Now it appeared that the 'C' bit was not being written on the tape. We traced the Write Bus 'C' bit all the way to the 729's write head. It looked good. We decided to go home and leave the chaos spirits to their mischief. P.S. Tape Load failed once. The tape was not drawn down into the left vacuum channel. 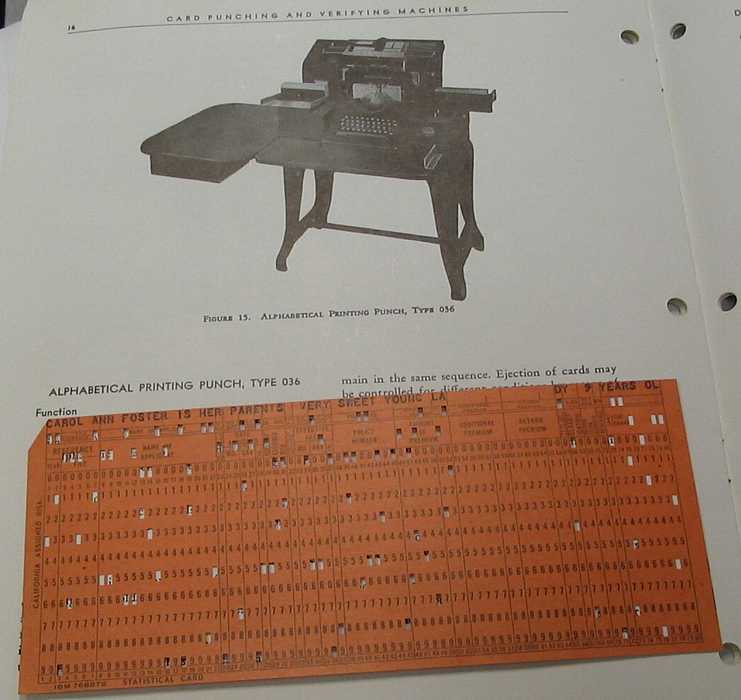 Ed Thelen experimented with keypunching the object deck of a routine to generate Pi. This version is intended for an 8,000 character memory 1401, outputting 2,000 digits of Pi. This shorter version avoids the use of the known defective upper 8,000 of our 16,000 character memory 1401. This object code was the result of a working program on ROPE. 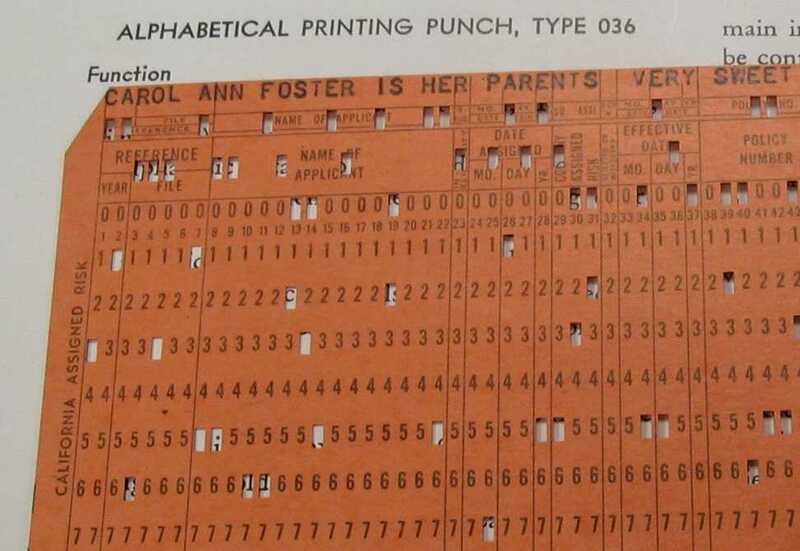 Because there is no assembler currently running on "our" 1401, I decided to try to keypunch the object code. and there are about 150 more cards yet to go. I decided to do other things with my life. Ron Crane thinks it would be nice to code a software UART in the 1401 to read an (ASCII to) BCD serial bit stream from a PC, and punch the result from the 1402 card punch. Randy Thelen suggested placing the software UART into the loader, eliminating the need for the 1402 card punch. I presume we would have to have to have a transmission verifications scheme to detect errors. I think it would be super to get either SPS or AutoCoder working on the 1401 - and save work? I put four 4' X 12' sheets of Plexiglas into the CHM shop, they are real long! ;-) There is also a full 1" thick plywood sheet to use for support while cutting. We might want to make some paper patterns before fragmenting full sheets. If we need more, I might be able to get a few 4' X 4' scraps for smaller cuts. Allen finished the tape drive components rebuild at Grant's shop on Monday. He is hauling all the motors, clutches, and shafts back to the CHM. We may soon have a few more 729 drives running. Mike Melas, from IBM Almaden, dropped by. 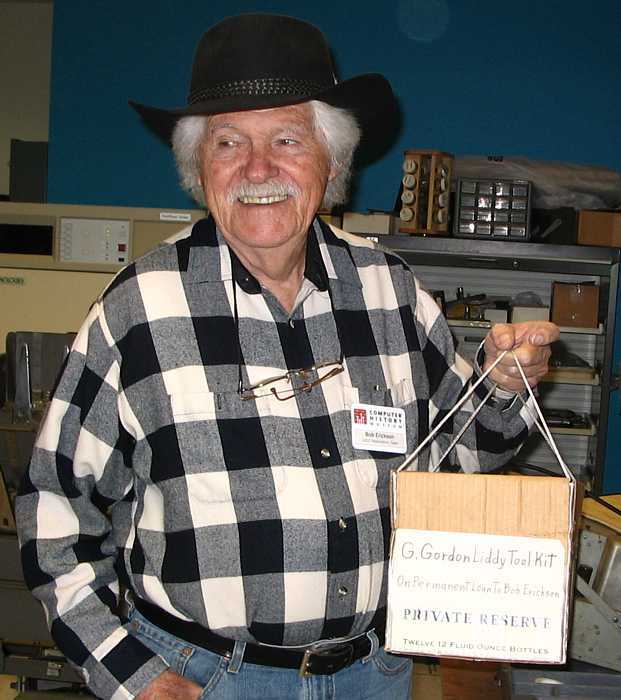 (He worked on the 1401's 7770 "Audio Response Unit", which gave voice to teller machines.) He'll return another Weds, when everyone is there. Hope you enjoyed your Thxgiving! We noticed a "life time" (about 12,000 cards ;-)) supply of 5081 cards by the key punch. That is better than a security blanket !! Trying to keypunch position sensitive code into unmarked cards is worse than no fun !! Ron was looking about at the intermittent card read error - wants to scope brush and circuit breaker timing this coming Wednesday. Hope someone brings in small iron filings Wednesday to see if we are writing on the mag tape "C" track. Alternatively, we could try to read a known well written tape. If the "C" track shows up on that, then for some reason the "C" track is not being written on the test tape. Present were: Ron Williams, Bob Erickson, Bill Flora, Glenn Lea, Frank King, Chuch Kantmann, Robert Garner and Ed Thelen. Here is an overview of the results so far :-)) The left side (when the protective paper is removed will show the drive belt, some gears and some timing cams. This shows a plastic button helping reinforce the plastic near a screw hole. The machine vibrates and shakes and probably stresses supports so that the extra material is helpful. Here is the glue used to attach/bond the support to the clear plastic. Bob Erickson and Glenn Lea worked on the second (Sellem's) key punch. They did a suggested by-pass of the Relay #2 holding coil (which is open) and the machine started feeding cards correctly - much to our surprise!! Here they are comparing the two keypunches (not identical) to try to verify that they are still on the right track. But Sellem's key punch did not register cards into the punch dies reliably - a transparent plastic card guide at the bottom of the track is missing - not bent, not broke, just plain missing. A search for broken parts in the bottom of the key punch, the chip bucket, ... with no trace of the missing card guide - bother! Frank King and Chuck Kantman working on the card feed mechanism of the 083 sorter. It doesn't work very well. Ron Williams and Bill Flora (with Robert Garner observing and commenting) continued worked on the intermittent card read error (with no read check reported!!). After some consideration they began observing the output of the 21 volt power supply - and dealing with the mystique of grounding scopes, ground loops, ground bounce, ... There is a voltage selection strap arrangement on the power supply. There are a number of strapable taps to select the voltage out of the ferroresonant regulator When set to 19 volts, the 1403 printer didn't work, and the lamp drivers on the 1401 front panel seemed disabled - and the card reader didn't read correctly at all.